The items below are listed alphabetically by maker, with featured items grouped at the top. A selection of basic black Parkers -- not Duofolds, but identical in construction and basic styling. 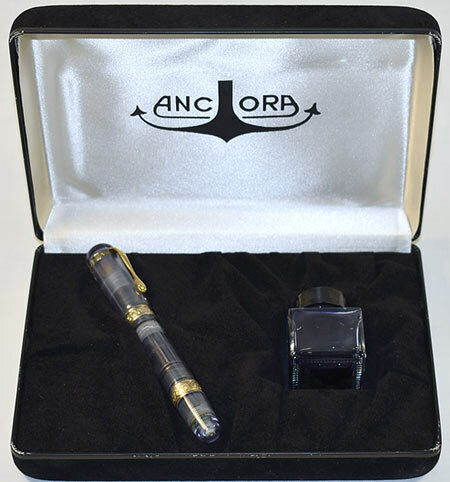 The "Black Line" and "Raven" pens have been getting serious collector interest recently. 13993: Parker 23½ Jack-Knife Safety: black chased hard rubber screw-cap button-filler, nickel plated trim, 13.3 cm long, early production with raised threads, slightly domed cap crown; intact Lucky Curve feed, #3 Lucky Curve nib with "lazy S" imprint is a fine writer, smooth pressureless strokes with nice feedback with pressure. 13996: Parker 23½ Jack-Knife Safety: black chased hard rubber screw-cap button-filler, gold filled trim, 13.45 cm long, intact Lucky Curve feed, #3 Lucky Curve nib is a noteworthy writer, responsive, smooth and lively; hard rubber is crisp and glossy, imprints sharp and bold, a few flaws to the cap top milling would appear to be (minor) factory defects. 13987: Parker D.Q. 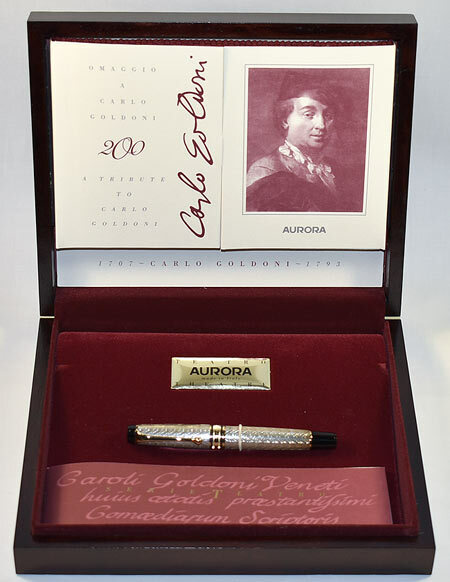 : long slender line-chased black celluloid "Duofold Quality" button-filler, 13.5 cm long, #3 Lucky Curve nib with "A3X" imprint, trim is gold filled trim instead of the usual nickel. 13615: Fairchild dip pen: gold filled holder with pearl taper, 14.8 cm long excluding ventless Fairchild #4 nib; holder fully marked, nice and clean noting slight seam opening towards front (see detail), does not affect function. Nib is springy, not soft. 13928: Hicks magic pencil: rare oversize ringtop, 8.7 cm long closed, 15.3 cm extended, uses 2.5 mm lead, advances and retracts; no maker's marks but of distinctive construction, scattered pinprick dings, one larger bump and test mark on end (see details), mechanism works solidly and smoothly. 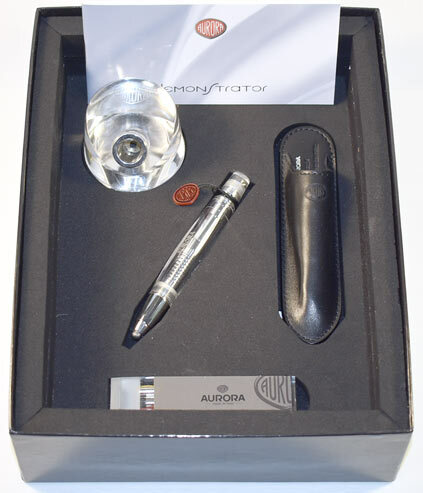 13868: OMAS Cristoforo Colombo II in box: limited edition, faceted briarwood piston-filler, 14.2 cm long, gold plated trim, two-tone 18K nib, with inner and outer boxes, instructions and semicircular papers. 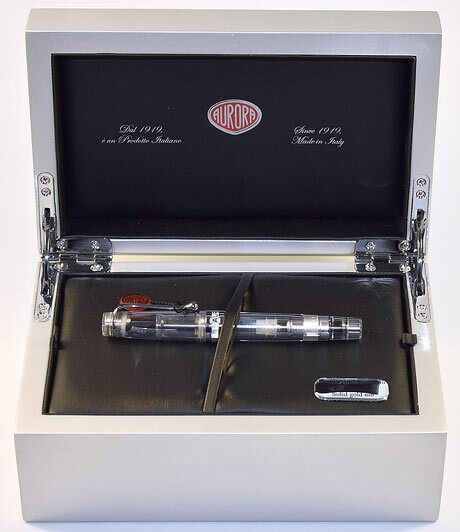 13973: Parker 61 Classic in box: grey USA-made capillary-filler, 13.5 cm long, frosty Lustraloy cap; red-colored pad, unstained, in end of uninked capillary filling unit (pen cannot be returned if inked). Some minor staining to box.